By the age of fifteen, Kerri McCaffety had already worked for a small-town newspaper and won numerous awards for her poetry. At Houstonâ€™s High School for the Performing and Visual Arts, she majored in both photography and creative writing. She then moved to New Orleans to attend Tulane Universityâ€™s Newcomb College. There she earned a degree in anthropology with a concentration in ethnographic documentary, going on to photograph people and their environs in Europe, Central Africa, and Haiti. Her first publication, Obituary Cocktail: The Great Saloons of New OrleansÂ¸ was named Book of the Year by the New Orleans Gulf South Booksellers Association. The same group named McCaffety Author for the Year for 1998. She went on to receive the 1999 Gold Lowell Thomas Award from the Society of American Travel Writers and was named one of New Orleans Magazineâ€™s People to Watch that same year. Her works have earned her Gold and Silver Benjamin Franklin Awards, an Alpha award, and two Silver Independent Publisher Book Awards, among other accolades. McCaffetyâ€™s writing and photojournalism have appeared in such publications as Oxford American, Town and Country, Historic Traveler, Colonial Homes, Southern Accents, Travel + Leisure, Metropolitan Home, and Louisiana Cultural Vistas. 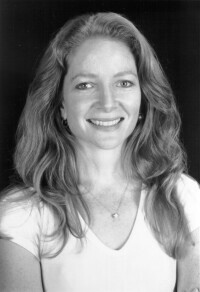 In 2007 and 2008, McCaffety served as features editor for Louisiana Homes and Gardens Magazine. She continues her award-winning work documenting the architectural and cultural history of her adoptive city of New Orleans. From the antebellum legacies of grand old restaurants like Antoine’s, Commander’s Palace, and Bruning’s to the newcomers like Jacques-Imo’s, Bayona, and Clancy’s, not to mention the legion in between, the countless stories of establishments dedicated to the je ne sais quoi of dining form part of the essential history of New Orleans. This rich mix of history and evocative photographs documents an unparalleled majesty of the senses, a decadent revelry in the past, and the daily marking of pleasure. Hardcover. Whether you’re a resident of New Orleans or you simply want to make the most of your visit, this visual guide by celebrated New Orleans photographer Kerri McCaffety will lead you down the right path! With stunning visual artistry, McCaffety’s photography, called “sensual and rich” by Francis Ford Coppola, vividly captures the character of sixty different Crescent City locations. Selected from the book by the same title, these framing-quality images evoke the multi-layered architectural history of the five-mile stretch of New Orleans that encompasses a century of architectural styles, including intricate Queen Ann houses, stately Italianate and Richardsonian mansions, and more. This is where the old and new live cheek-by-jowl, where decay is an art form, and where preservation is a way of life. Notecards. 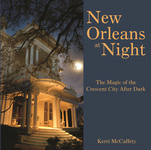 Selected from the book by the same title, these framing-quality images evoke the multi-layered architectural history of the five-mile stretch of New Orleans that encompasses a century of architectural styles, including intricate Queen Ann houses, stately Italianate and Richardsonian mansions, and more. Postcards. 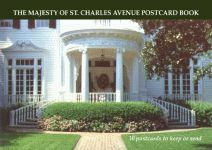 The jewel of America’s great avenues, St. Charles Avenue is a five-mile journey through a century of architectural styles. Presented here are never-published interiors, with all the visual poetry and lyricism of this sultry southern city. Hardcover. 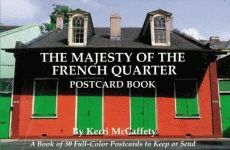 Compiled from Kerri McCaffety's companion volume, The Majesty of the French Quarter, the striking images that grace these postcards and notecards include such familiar sights as St. Louis Cathedral and Antoine's restaurant, as well as rare glimpses of hidden courtyards and secluded interiors. Notecards. 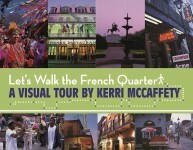 Compiled from Kerri McCaffety's companion volume, The Majesty of the French Quarter ($35.00), the striking images that grace these postcards and notecards include such familiar sights as St. Louis Cathedral and Antoine's restaurant, as well as rare glimpses of hidden courtyards and secluded interiors. Postcards. Through striking photographs and polished prose, The Majesty of the French Quarter opens the locked door and invites readers to discover a multitude of hidden marvels. among the discovered gems is the 1828 Bourbon Street mansion of Lindy Boggs, U. S. ambassador to the Vatican and former congresswoman. Pictured are many such homes’ secret, overgrown gardens where, noted Capote, “mimosa and camellias contrast color, and lazing lizards, flicking their forked tongues, race along palm fronds.” Also featured are rare glimpses of the antique-filled and artfully decorated interiors of some of the Quarter’s most majestic homes, including that of New Orleans novelist Julie Smith. The Napoleon House has seduced New Orleans visitors and locals for generations and become a favorite destination for all connoisseurs of atmosphere. In lyrical prose and luminous photographs, Mikko Macchione and Kerri McCaffety tell its story. The New Orleans Times-Picayune says that photographer Kerri McCaffety “knows how to capture the fleeting beauty of a moment,” and once again she does so in a stunning visual exploration of the Crescent City after hours. When the sun sets over the Mississippi River and the streets begin to glow beneath the warmth of the city’s antique gaslights, the beauty of New Orleans is at its peak. The unique architectural gems of the Garden District, up and down Canal Street, and woven throughout the French Quarter almost require that they be revered under the cover of darkness. Presented in the pages of this book is an amazing pictorial overview of some of the finest drinking establishments in the world still operating today and cherished photographs of those no longer open. Lavishly illustrated with 200 color photographs, this lush history provides a glimpse into the architectural and cultural treasures of New Orleans’ drinking scene. It overflows with tantalizing stories from the best bars in town. This photographic tribute displays the rich cultural tradition behind New Orleans’ St. Joseph altars and their delicious dishes. While examining the spiritual significance of the altars and the accompanying foods, McCaffety also discusses their cultural importance to both Sicilian Americans and the people of New Orleans. Hardcover. Woven throughout the parish of St. Francisville in South Louisiana are picturesque bayous and rivers that made the surrounding land idyllic for constructing plantations and other grand homes in the early nineteenth century. Presented here in spectacular color photographs are more than 160 images of quaint cottages and elegant plantations of St. Francisville and its environs. 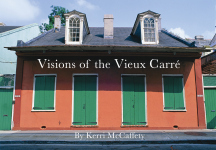 Compiled from Kerri McCaffety’s companion volume, The Majesty of the French Quarter, the striking images that grace these pages include such familiar sights as the St. Louis Cathedral and Antoine’s restaurant as well as rare glimpses of hidden courtyards and secluded interiors. Each of McCaffety’s photographs is accompanied by a caption that echoes the beauty of the iconic image.